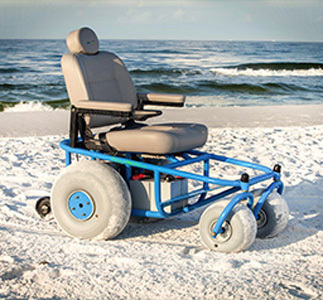 The Outdoor Extreme Beach Cruiser is a sharp looking, mass-produced powered beach wheelchair that’s very reliable and built to last. It gets all the basics and aesthetics checked, but not as customizable as its competitors. 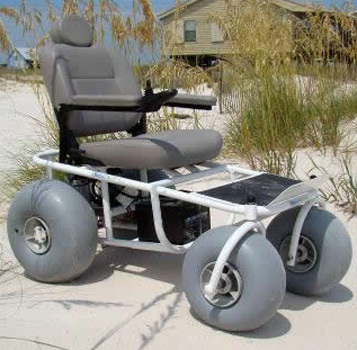 Recommended for people looking for an already polished beach wheelchair that’s ready to roll. If you want a highly customized chair, this is probably not your cup of tea. Are you a beach lover with a bit of an adventurous streak? Have you been looking for a great, high quality powered beach cruiser that will enable you to enjoy a day of sun and sand, and also allow you to venture into the wilds for a camping expedition or fishing trip once in a while? If so, then you’re going to love what you read about in this review. The Outdoor Extreme Mobility Beach Cruiser is built for a fairly specific kind of person. A person who prefers stock options over unlimited customization. Who likes his or her products to be highly polished, with lots of subtle details and finishing touches, and who isn’t an extreme outdoorsman, but is certainly open to the idea of occasional adventures. The more closely that defines and describes you, the more excited you’re going to be about this product, and in the sections that follow, we’ll tell you everything the Beach Cruiser can and can’t do so you’ll have all the information you need to decide if this is the model you’ve been searching for. If that sounds good to you, let’s jump right in and see what this one has to offer! Polished. That’s the first word that springs to mind when you set eyes on the Outdoor Extreme Mobility Beach Cruiser. It looks like a well-made, dependable mass-produced mobility aid, and that’s precisely what it is. Outdoor Extreme Mobility isn’t a huge company, but they are well-respected in the industry, and their products are exceptional. In fact, both of the wheelchairs they make, this one and the Extreme Mobility Nomad took top honors in their respective categories in our recent roundup review. They’re a bit on the expensive side, sure, but you get what you pay for. These machines are good looking and built to last. Both of those things matter, and for many, they matter more than extras and extreme customizability. As with most beach chairs, the frame is high-quality aircraft aluminum that’s been powder coated to help it better resist the corrosive effects of the beach environment, and the marine-grade batteries are sealed and waterproofed, so you need not worry about getting the chair wet. In addition to that, the Cruiser sports stainless-steel hardware (which also helps to resist the corrosive effects of the environment it’s primarily designed for), and it features an onboard/off-board charging unit. The top speed and range are perfectly acceptable for casual beach use, but the 10-mile range is a shade underwhelming if you plan to equip it with all-terrain tires and take it deep into the wilds. You’ll definitely want to pack in some solar panels for on the go charging, but the design is hampered somewhat on that front by limited storage space, which we’ll talk more about in a later section. Even if you ultimately decide against this model, it’s undeniably a sharp looking, thoughtfully designed ride! The seat reclines (manually), and the armrests are adjustable and hinged so you can swivel them out of the way, which makes getting into and out of the chair a simple proposition. The footboard is also adjustable, which covers the “Big Three” adjustment options you’d expect to see on a chair like this. The Captain’s-style seat is well-padded and quite comfortable. When reclined, you’ll easily be able to relax, read a book, enjoy fishing, or even enjoy a short nap if that’s what the day calls for. The Cruiser has a moderate number of extras on offer but many of its less expensive competitors fare better. This is because many other products in the powered beach category like the AJ’s Cruzr and the Nomad are custom, hand-built machines, which gives them almost an unfair advantage where extras are concerned since buyers can request pretty much anything they want. That’s a key point of differentiation. This is a mass-produced machine, with all the advantages and disadvantages that come with that classification. On the upside, production values and aesthetics are incredibly high and uniform, which many people like. The downside though, is that the product is what it is. You can pick from a modestly-sized menu of upgrade options, adding them on as you like, but this isn’t the chair you want if you’re interested in buying something totally custom. Also, the seat can be ordered in four different color options: Black, Grey, Brown, or Tan, and you can choose from more than six thousand different color options for your ride. Note that Outdoor Extreme Mobility gets their tires from Wheeleez, which is a well-known brand, so when it comes time to replace them, doing so is easy. 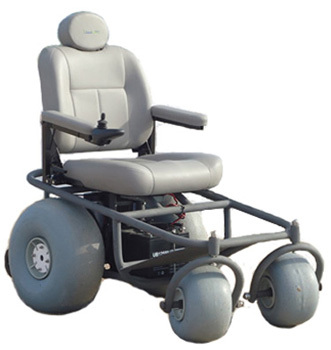 Also note that you can order the same tires that go on the Extreme Mobility Nomad (the other product the company makes), which will take this chair from a beach cruiser to a go-anywhere, all-terrain adventure chair. Where storage is concerned, we find the Beach Cruiser to be a bit wanting, although it’s easy enough to add an aftermarket storage bag or basket. Even so, the relative lack of storage did reduce the model’s final score a bit with us. Forget about trying to fit this in your trunk, hatchback, or SUV. It’s just not going to happen, and you’ll need to factor that into the equation when making your purchase, because adding a lift or buying one of the vehicles mentioned above, plus a ramp will increase your total cost of ownership. This is a bit of a hidden advantage that mass-produced vehicles have over their custom-built counterparts. Mass-produced vehicles, being highly standardized, also tend to be very easy to use. With hand-built vehicles, you can pretty much add as many features as you want, and with each new thing you add, you’ll be slightly increasing the slope of the learning curve. 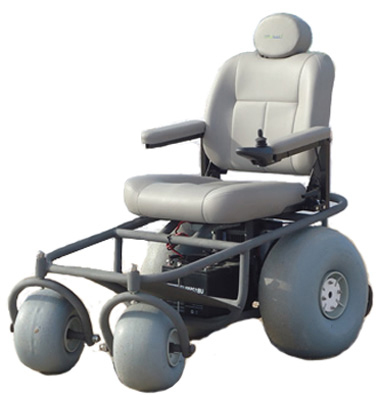 While it will take you a few minutes to get used to the chair’s handling and familiarize yourself with the controls, you’ll be driving around with confidence in a matter of minutes. 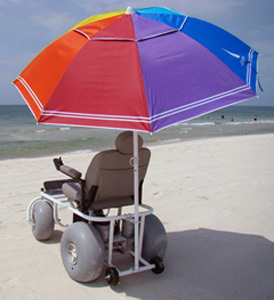 None of the beach wheelchairs you’ll find reviewed on our site are designed for indoor use. They’re just too big, and those oversized tires would knock things over in your house left and right. It’s possible that you could drive it around in one of the main corridors of a shopping mall, but trying to take it into one of the stores would be a losing proposition, so for all intents and purposes, let’s just call it outdoor use only. There’s a lot to like about the Outdoor Extreme Beach Cruiser, but it’s not for everyone. People who are in the market for a chair like this tend to fall into a couple of broadly defined groups. Depending on which group best describes you, you’ll either love this chair or be unimpressed by it. First, you either prefer mass-produced, highly standardized products that offer some canned options that allow you to personalize it a bit, but you don’t need anything highly custom. If you’re in the first group, you’ll like this model a lot. Second, you’re either looking for a casual use, powered beach chair for leisure activities or you’re more of an outdoorsman and are looking for a chair that can do that but can also take you camping, hunting, fishing, and the like. If you’re in the first of those two groups, then there’s no point in spending the extra money on this model. It’s just more chair than you need. If you’re in the second group, however, yeah. This is an excellent choice, but there’s a catch. This is not the chair you want if you consider yourself to be an extreme outdoorsman. 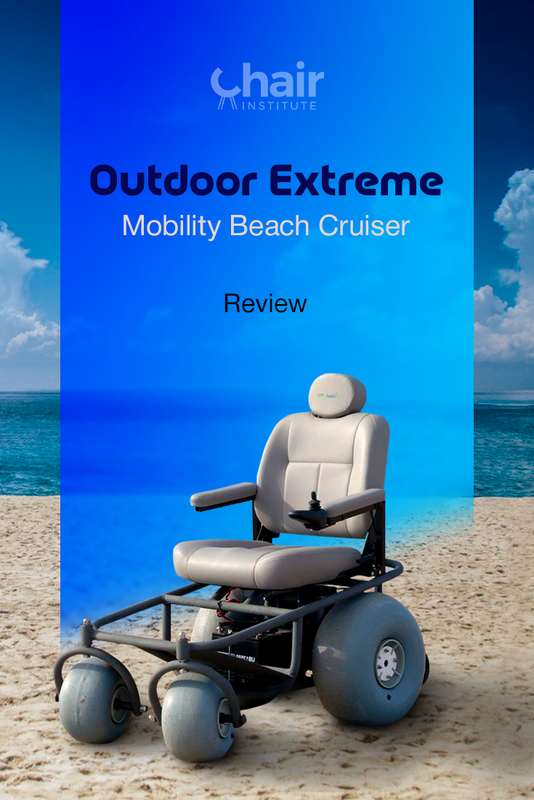 It’s fine for light to moderately challenging adventures away from the beach, but if you love getting away from it all, then Extreme Mobility’s other product (the Nomad) is probably the chair you’re looking for. In any case, the distinctions drawn by the two broad classifications above describe pretty much everything about the Beach Cruiser. It’s a fantastic, highly polished design that doesn’t have many weaknesses. People will tend to like/not like it based on their preferences as described above. Prefers the high production values and standardization that comes with a mass-produced product, and who are looking for lots of polish and small finishing touches. Don’t care too much for highly custom options, and is content with basic options, picking the paint color, etc. 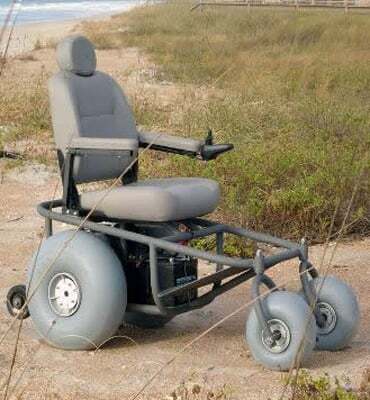 Is at least a bit of an outdoorsman and looking for a chair that can handle a variety of terrains, plus get them around on the beach when the mood strikes. The more of those statements that apply to you, the happier you’ll be with this model, and we highly recommend it. If, on the other hand, you’re looking for a chair you can customize to your heart’s content, we’d recommend taking a pass on this one, and checking out the Nomad instead. Outdoor Extreme Mobility, Official Brand Website. How to Travel the World in A Wheelchair, Nomadic Matt. 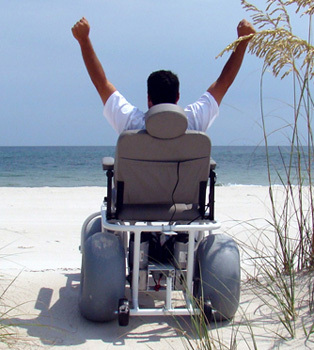 Wheelchair Accessible Beaches in the U.S., Karman Healthcare. 10 Absolute Truths of Life in A Wheelchair, The Mobility Resource. 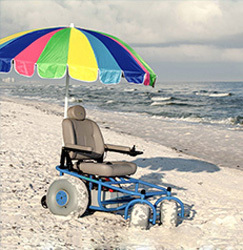 The Best Wheelchair Accessible Beaches in Florida, Spin the Sunshine State.